The DreamWeaver is a musical environment. It is a space of love. A space of nonjudgmental assessment, offering access to your inner sanctum. A remembering of all of WHO YOU ARE. 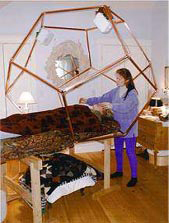 The sacred geometric form is a Dodecahedron. It connects us to our Spirit essence and anchors it into the physical world. love this, felt sooooooo very good after a session. my son had a session and he is sooooooo much better off now. he stated he got a lot out of it and helped him with an issue.